There are various salads that are made with the combination of different food items. Some of them are even made with a combination of walnuts and mozzarella cheese. One such salad, which uses these ingredients, is called Bacon and Black Pudding Salad with Walnuts and Mozzarella. This is a light and delicious dish, which one can relish along with a meal or as a starter. Bacon and Black Pudding Salad with Walnuts and Mozzarella will also be a great option to add in to the menu because it has a simple recipe and gets prepared in less than 20 minutes. So the next time someone drops at your place without informing, Bacon and Black Pudding Salad with Walnuts and Mozzarella is the answer to your light supper problem in a short time. In addition to this you can also vary its ingredients in order to make it your own salad. 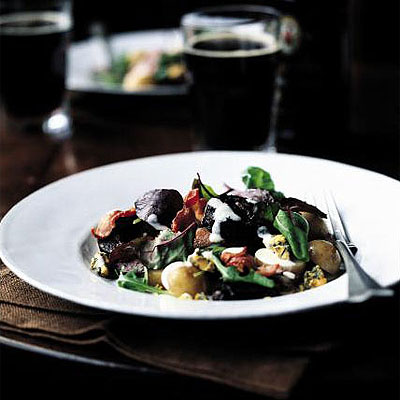 However, for the time being, explained below is the frequently used recipe of Bacon and Black Pudding Salad with Walnuts and Mozzarella to make this dish. Take olive oil in a frying pan that should be heavy based and heat it. After the olive oil is heated then place cubes of black pudding together with the cubes of smoked bacon and walnut halves in the pan and fry them. Keep cooking until the cubes of smoked bacon become crispy. Take rocket leaves and equally divide them in four plates and top them off with even amounts of the black pudding and bacon mixture. Subsequently put the mozzarella cheese on top of the black pudding and bacon mixture. Sprinkle the French dressing over this cheese afterwards. Then, garnish each plate of mixture and topping with fresh dill.